The Orlando massacre is the most recent time an high-powered semi-automatic rifle was used in a mass killing. Now, there are petitions with hundreds of thousands of signatures calling for a ban on what those people call assault rifles. 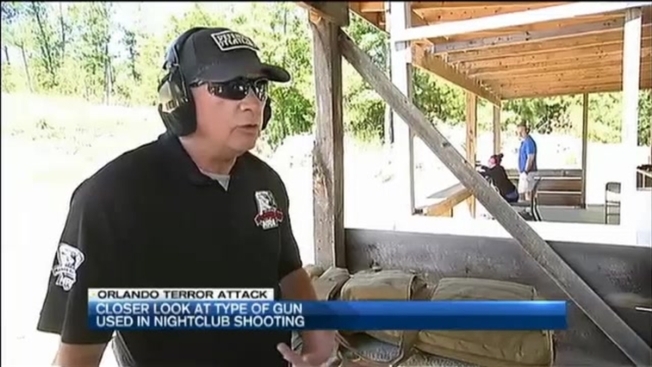 Safety instructors at the Londonderry Fish and Game Club in New Hampshire fired an AR-15 to demonstrate the weapon. "Ten rounds, just like that," explained Defensive Strategies owner Bob Boilard after shooting the gun. The ease with which those rounds were fired is exactly why critics say AR-15-style weapons should be banned. Boilard argues that another weapon could cause just as much damage. "Of course it could," he said. Boilard says the problem is not with the gun, but the individual behind it. "It's a tool, just like any other tools," Boilard explained. Experts say the semi-automatic AR-15 is very similar to the Sig Sauer MCX used in the Orlando massacre, but there's one big difference. Fish and Game club President Rick Olson says the MCX allows the user to change calibers quickly and efficiently. "You can change it out to the AK-47 round or you can change it out to the 300 blackout," Olson said. "300 blackout is much larger round and has a heck of a lot more power to it," Boilard said. Olson, a Marine Corps veteran, says contrary to popular belief, "AR" does not stand for "Assault Rifle." Still, many residents and politicians are convinced killing is all they're good for. "Statistics defy that logic," Olson said. "There are literally millions of these rifles owned around the US and what segment of these rifles are actually used for crime? It is not even a tenth of a percent." Right now, there's at least one sentiment that people on both sides of the gun debate can share. "I'm absolutely heartbroken," Olson admits. But the belief that stricter gun laws could've prevented the Pulse shooting is one these gun enthusiasts will never share. "There's laws against murder, there's laws against using firearms illegally," Boilard said. "You can make all the laws you want, but criminals don't care about laws." Petitions to ban "assault rifles" across the U.S., which started circulating hours after the Orlando shooting, already have half a million signatures.